Perhaps we’d got too used to winning! In July Boss Racing came away from a parched Brands Hatch with two wins from the two races we entered. Yet at Thruxton a month later we had to settle for a second and two thirds. I say “settle” but it was nothing to be ashamed of and it meant the other drivers had a taste of success, which, hopefully will encourage them. Not that our Brands successes came easily. They didn’t, thanks to the Classic Sports Car Cub’s system of success penalties. 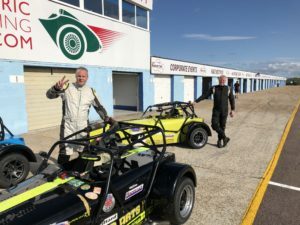 Both Christian Pittard and Tim Davis had to take a five-place hit on the grid for the Gold Arts Magnificent Sevens race at the club’s Brands bonanza meeting on 14/15 July. But for this, Christian (Caterham CSR 2300) and Tim (C400 2400) would have been first and second on the grid after a stunning qualifying performance, Christian setting a ‘pole’ time of 48.80 seconds. As it was, Christian lined up sixth and Tim seventh. This meant that Colin Watson in our number 92 C400 2400 sat on pole with Richard Carter (R300 2300) third. Peter Hargroves (Superlight R2000) was 20th and Peter French (Superlight 1800) 25th. For this meeting we were supporting Alex Harbour (Supersport 1600) and he qualified 24th and first in class. The “Spa Special” engine normally fitted to Colin’s car wasn’t quite ready, so he had to make do with a lower-power unit. Even so, he managed to hold on to second place for eight laps before dropping back but by lap 12 as the pit window opened the top six were covered by 1.2 seconds and had already begun lapping people. Shortly after the pit stops Christian had a ‘moment’ at Clearways which cost him ten seconds and was to prove fatal as he finished fourth despite his best efforts to catch leaders, setting fastest lap along the way. Tim drove faultlessly however reeling in Gary Bate and then Peter Ratcliff by lap 22. Ratcliff endured eight laps of pressure before Tim was through in to the lead which he held to the chequered flag despite the attentions of the rapid Gary Bate. Just half a second separated them at the flag. Richard was seventh, Peter Hargroves 16th and Alex a class-leading 21st. Peter French was 28th. Alex also put up the fastest lap in his class. Christian’s turn to win came in the Racetruck Open Series race. He started from pole with Tim fourth, Richard fifth, Peter Hargroves 15th and Alex 22nd. Christian led throughout with Tim following him for much of the race. Towards the end, however it was Tim’s turn to have a moment at Paddock Hill Bend avoiding an errant slower runner and this dropped him to third at the flag. Richard and Peter also finished in the top ten, in sixth and ninth respectively. Alex was 18th. Tim recorded the fastest lap of the race, comfortably inside his qualifying time, while Peter was the quickest runner in his class. In its issue of 19 July Autosport carried a comprehensive report illustrated by an impressive picture of Tim winning the Mag Sevens race. A month after Brands, conditions for the CSCC’s Thruxton Thriller meeting at Britain’s fastest circuit were considerably cooler – at least as far as the weather was concerned. Things certainly hotted up for us during Friday testing when Johnny Pittard’s supercharged Caterham developed what’s best described as a water feature with clouds of steam issuing from the exhaust. That certainly put paid to Johnny’s testing but then Tim struck trouble in the next session with, well, engine issues. Christian Pittard was right behind and spun trying to avoid Tim’s stricken car. That wasn’t all. On his out-lap Hugh Coulter wiped two wheels off his car in an encounter with another competitor that was a little too-close. The session was red-flagged as a result and the team spent Friday night repairing the car. On Saturday morning Jack Hannah and I returned to the workshop to prepare Johnny Pittard’s old car with its K Series engine as well as our number 92 car for Tim to use. Fortunately we weren’t racing until Sunday! Qualifying for the Open Series race represented Tim’s first outing in the Boss car and he set a restrained eighth fastest time. Johnny, however, managed third with Christian going one better to line up in second spot. Richard was seventh with Hugh and Colin Watson sharing the 93 car to line up 11th. Peter Hargroves was 14th. In the early going Christian ran with the leading group and took the lead on lap 9. Despite his unfamiliarity with the car, Tim was moving up and the two swapped places. Tim took the lead on lap 12 and held it until lap 22 but a mistake at the complex caused him to spin on the very last lap. He also had a fuel issue so wasn’t classified. Christian spent much of the race fighting for the lead but finished third, one place ahead of Jonny. Richard was 11th having lost time with a second pit stop due to a puncture. Coulter/Watson were 12th with Peter 18th. As it happened, Jonny was lucky to finish at all. The Thruxton bumps had left his car with a cracked radiator and damaged alternator. Thankfully, we were able to change these components before the start of the Mag Sevens race which was due to start after the lunch break. Tim had set second fastest qualifying lap but the CSCC success penalty relegated him to 12th on the grid. This promoted Christian to third, Richard to fourth and Jonny to fifth. Coulter/Watson lined up tenth with Peter Hargroves 13th. Tim, Christian and Jonny spent the initial stages of the race fighting for the lead with eventual winner Jonathan Mitchell. All three Boss runners took turns in front, but Tim and Christian were both forced to drop out on lap 15 of this 28-lap race. Christian suffered a broken throttle cable, while Tim hit a kerb and damaged his front suspension. This left Jonny to finish second with Richard third. Hugh and Colin came home seventh with Peter 11th. There was some consolation for Tim as he was credited with the fastest lap of the race by a fairly comfortable margin. Jonny also set fastest lap in his class.